Greetings, once again, fellow historico-medico aficionados, and welcome to another installment of CEPI Curiosities, our monthly journey into the realm of the medically unusual. Observant regular readers will notice this publication appears on the twentieth of every month. It just so happens that February 20th is Presidents Day, our yearly celebration of America’s highest elected office; in honor of the day, it seems fitting that we do another issue on Presidential medical history. We’ve done more than a few of those here, from whether Zachary Taylor was murdered by arsenic poisoning, to the questionable mental state of Presidential candidate William Jennings Bryan, to whether a long inaugural address or the White House itself killed William Henry Harrison. Perhaps a more timely topic than I had initially planned, this issue examines the clandestine efforts of a select group to seek out and remove a dangerous foreign invader with very close connections to the President of the United States himself! Of course I’m talking about President Grover Cleveland’s tumor and the secret surgeries to remove it (what did you think I was talking about?). Grover Cleveland is another one of those Presidents who to modern audiences falls in that historical void between more famous Presidents such as Abraham Lincoln and Theodore Roosevelt. Born in New York in 1837, he served as Mayor of Buffalo and Governor of New York and was elected President in 1884 and again in 1892, making him technically the 22nd and 24th US Presidents. Cleveland holds the distinction of the only US President to serve two non-consecutive terms. However, secrecy was to be maintained at all costs. The American economy was in a tumultuous state in 1893. Speculation, especially over railroads, had been responsible for a series of severe recessions dating back to the infamous Panic of 1873. The 1870s and 1880s were characterized by high unemployment, inflation, and labor unrest. Another economic meltdown plunged the country back into recession in early 1893 (again brought upon part by railroad speculation), known now as the Panic of 1893. A year later, Cleveland himself would send federal troops to Chicago to put down a strike involving Pullman railroad workers. Cleveland feared news of his ill health would place greater strain on an already strained economy. As a result, he was emphatic that his tumor remain a secret. Lamont, Bryant, and O’Reilly organized with a small group of medically-minded confederates to arrange for Cleveland to have his surgery on the Oneida, a yacht owned by a friend of the President named E.C. Benedict. Among the doctors involved was William Williams Keen. Keen was an extremely accomplished surgeon and a Fellow of the College of the Physicians of Philadelphia. Born in Philadelphia in 1837, Keen studied at Jefferson Medical College, served as an Army surgeon during the Civil War, and penned a paper with Silas Weir Mitchell (also a Fellow) on the treatment of gunshot wounds. After the war he became a pioneer in the study of brain surgery and was reportedly the first American to successfully remove a brain tumor. Along with Bryant, O’Reilly, and Keen, E.G. Janeway, John F. Erdmann, and Fred Hasbrook rounded out the rest of the team charged with removing President Cleveland’s tumor. On June 30, 1893, Cleveland arrived in Jersey City, NJ, and from there boarded the Oneida where the surgical team awaited him. Bryant successfully removed the tumor, along with five teeth and part of his jaw, the following day. The President was by all accounts in good spirits given the situation, and he remained on the Oneida until July 5, when he returned to Gray Gables, his Cape Cod estate. By all outward appearances, he had just returned from a long Fourth of July vacation. When a second tumor was discovered several days later, Cleveland returned to the Oneida on July 17th to have the second growth removed. Discretion was to be maintained at all times. Bryant removed the tumor using specialized tools that would allow him to remove it through Cleveland’s mouth. Rumors hold this was because he didn’t want to lose his trademark mustache, but it is just as likely Cleveland wanted there to be no physical evidence of his procedure. Gibson designed a hard rubber prosthetic to replace the excised section of Cleveland’s jaw, allowing the President to speak unimpeded. He also cast a mold of his jaw, followed by a second one several years later to monitor’s Cleveland’s healing progress. 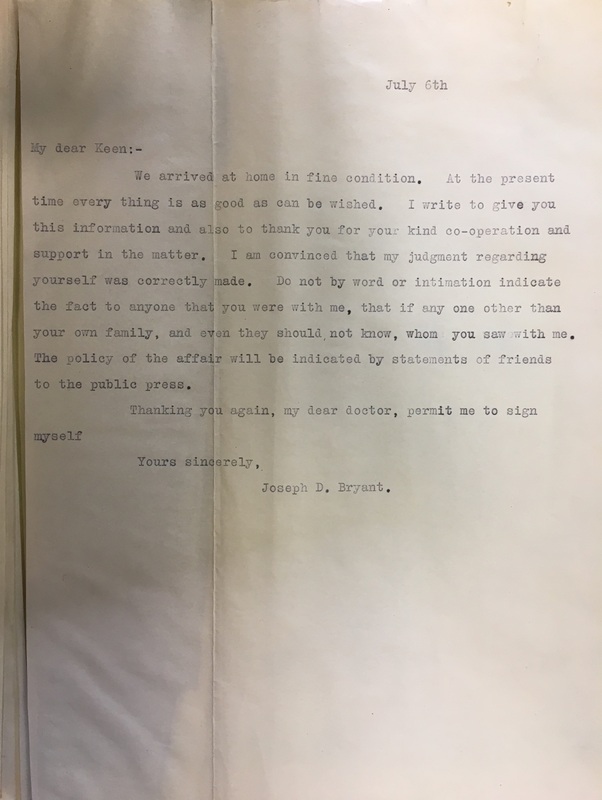 As for Keen, Bryant wrote to him on July 6, praising his efforts and re-affirming the need for confidentiality. However, even the best-kept secrets, especially when they involve the Commander in Chief, can be found out. On August 29, 1893, Elisha Jay Edwards of the Philadelphia Press broke the story in an article bearing the provocative title “The President is a Very Sick Man” (journalist Matthew Algeo later used this as the title for his 2011 book covering Cleveland’s secret surgery). White House officials flatly denied the affair until September 22, 1917, when Keen published an article explaining the whole affair followed by a book later that year.